Remember the days....? Just cupcakes, punch...........friends from school. A long way from the extravaganzas of today for our grandchildren. Glad to see a new post, especially after so many months with no activity. I'm as guilty as everyone, but will try to take the time from now on. By the way, M.E., where did y'all live when that picture was taken? Winburn Street, close to where East Elementary School was built. Looks like meadow & trees on other side of the fence, but must have been low camera angle......that was a narrow side street, and there were houses all around. 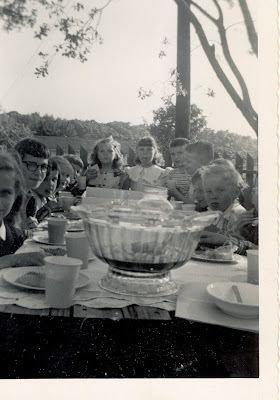 Decided the photo was made in April 1952.....school friends in photo, but it was PRE-glasses era for me!